Ananias and Sapphira, Who or What Killed Them? Who were Ananias and Sapphira? Ananias and his wife Sapphira were members of the early Christian Jerusalem church. Their story is related in the Bible in the book of Acts chapter 5, where they died suddenly after lying to the Holy Spirit and the Apostles. Many people struggle to understand the meaning of the story of Ananias and Sapphira, especially in terms of the grace of God. Some Grace preachers have suggested that they were not really believers, implying that in someway, it was okay to kill unbelievers. Others have written extensively about how God had killed them, and how this was the way the Church will be in the future, obey or die. No one knows for sure what happened. The best we can hope for is an explanation that fits the text and matches the character of God. Acts Chapter 5 opens on the heels of the the Apostles witnessing throughout Jerusalem of the resurrection of Jesus and the coming judgement upon Jerusalem (Acts 2:16-20). The 1st century Jews understood the warnings of Jesus. So they sold all that they had and cared for each other as a community. In the meanwhile they awaited the impending judgement if Israel’s leader didn’t repent (Matthew 24). This brings us onto the story of Ananias and Sapphira. They sold their possessions and kept some of the money (Acts 5:1-2). At this time, Christianity was being preached to the Jews only (read: The Dividing Line in the Book of Acts). The revelation of the Gospel of grace had not yet been revealed to Paul and shared with the twelve. The Apostles were preaching Jesus, the slain lamb, in the context of the Law of Moses. Peter did not even know that the Gentiles were included until Acts 10. Even then, he is still conscious of the law when he entered the house of Cornelius. Acts 10:28 And he said unto them, You know how that it is an unlawful thing for a man that is a Jew to keep company, or come unto one of another nation. But God has showed me that I should not call any man common or unclean. 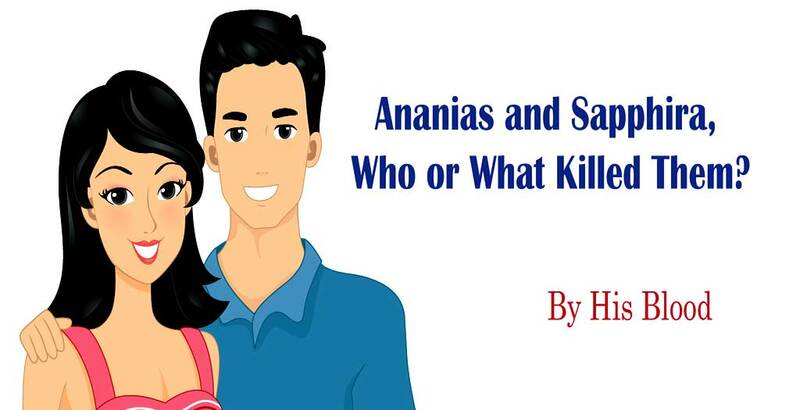 So, Who or What Killed Ananias and Sapphira? I want to focus on the verse that I believe offers insight into what happened. Acts 5:5 And Ananias hearing these words fell down, and gave up the ghost. And great fear came on all them that heard these things. What killed Ananias according to this passage? The words he heard from Peter killed him, that’s all we know. Now, there is no way to know for sure what happened. In my opinion, Peter, under the power of Holy Spirit, had judged Ananias to be a liar and, being conscious of the law, the words he spoke killed him. A very literal interpretation of Proverbs 18:21 Death and life are in the power of the tongue. Let’s read on to the account of Sapphira and see if anything gets clearer. Acts 5:9 – 10 Then Peter said unto her, How is it that you have agreed together to tempt the Spirit of the Lord? Behold, the feet of them which have buried your husband are at the door, and shall carry you out. Then fell she down straightway at his feet, and yielded up the ghost. And the young men came in, and found her dead, and, carrying her forth, buried her by her husband. Again, the verse does not say what killed her. But, we see that Peter spoke what was going to happen, and it happened. In my opinion, Peter killed them with the power of his words. Understanding the nature of kingship (see: We have been made Kings) that we have as believers, understanding the law-consciousness of Peter prior to the revelation that was given to Paul, and understanding that the only indicator we have is that what Peter spoke came to pass, in my opinion, Peter was the one who spoke death over Ananias and Sapphira. This account is much more befitting the character of Jesus. I’m reminded of the story where Jesus had just been preaching in a village that had rejected his words. Luke 9:51-56 And it came to pass, when the time was come that he should be received up, he steadfastly set his face to go to Jerusalem, And sent messengers before his face: and they went, and entered into a village of the Samaritans, to make ready for him. And they did not receive him, because his face was as though he would go to Jerusalem. And when his disciples James and John saw this, they said, Lord, wilt thou that we command fire to come down from heaven, and consume them, even as Elias did? But he turned, and rebuked them, and said, You know not what manner of spirit you are of. For the Son of man is not come to destroy men’s lives, but to save them. And they went to another village. Jesus is not in the business of killing people to evangelize, much to the disappointment of his disciples. The account never says that they could not call down fire. It only states that Jesus rebuked them for their desire to do so. I believe if God’s character was such that he had to kill people who lied to him, as in the case of Ananias and Sapphira, we would have seen that manifested in the life of Jesus when the Samaritan village rejected him. But what is evident from the above account is that the disciples had no problem with the idea of punishing those whom they thought deserved it and I believe that is what we see reflected in the Ananias and Sapphira story. Superb expounding. And Andrew says it like it is. Thank you. In my home-church group, we just finished discussion on this. We drew the conclusion that is commonly perceived. Apparently, however, they died from their own adrenalin surge…and toxic emotion…their hearts failed them. WOW!! I shall share all of this. It was the fact they didn’t give with a worthy heart, and by conviction of the Holy Spirit, they were killed. That’s how my Pastor puts it. It matters not how much they would give; it was their property after all, and if they wanted to keep 3/4 of the $ and give the remaining 1/4, it likely would’ve been okay, as long as they felt led by God to do so. Their hearts were greedy and prideful; they gave out of obligation, and lied about it. If they’d been honest and not said they gave all proceeds to the church, if they would’ve given with a humbled heart, and out of obedience to God in all love and truth, they would not have been punished. Still, they lied, they were prideful and greedy, and they gave an unworthy sacrifice, much like how that Cain gave.. thus, it matters not whether they were saved or not in the end. Of course, for their sake, we hope they were. But the bottom line moral of the story is, give joyfully out of the abundance of God’s grace, and be honest about it 🙂 Don’t take credit if it isn’t due, and recognize all we have is from God, thus we are not our own. While that is a popular explanation, nowhere does it say they were convicted by the Holy Spirit. I believe if it was what they did that was the real culprit, they would have died as they gave the money dishonestly as the Holy Spirit doesn’t need someone to say anything to strike them dead. The fact remains nothing happened to them until Peter opened his mouth. Their giving and the status of their salvation is irrelevant. The Fact that they were Jews, and still living with a consciousness of the Law, had more to do with Peter’s judgment affecting them, over anything God did, in my opinion. This is just the first thing that pops into mind so take it with a grain of salt but I’m wondering if it wasn’t the weight of the law that caused such stress and condemnation that it resulted in their death? Kind of a physical manifestation of verses like Romans 7:11 and Galatians 2:19 which speak about sin killing through the commandment. Food for thought. In light of what Brook said, the fact that Jesus rebuked them in Luke where they wanted to call down fire, it appears to me that Peter abused his authority and power given by his kingship in salvation. Peter, probably still tainted by the law, being that salvation was still a new thing and all the power that goes with it, thought that they should be punished with death for seemingly lying to the Holy Spirit. First of all how can we lie to the Holy Spirit? He knows our hearts! Secondly, if so, that was a forgivable situation. Yes there was nothing wrong with them keeping some of the money. Guess they should’ve been more upfront about it. Peter dealt harshly with them, and abused his power and it cost them their lives. Death and life are in the power of the tongue. Especially where Christians are concerned. It cannot possibly have been God acting independently, that’s against the Word, and the Holy Spirit only convicts you of not believing Jesus -as explained in John 16:7-13-. On the other hand, I do believe Peter seemed to have been itching to speak death and pronounce judgement as if by the law. His faith was present with great manifestations of the Spirit and few or none unbelief. The best explanation would have been that Peter did it, if he would have said “If I am a prophet of God and you’re unworthy, you will drop dead”, but he didn’t to Ananias (though he did tell Sapphira something very much along those lines). I think he finally called fire to come down. your interpretation is wrong. the death of Ananias and sapphira wsa the Judgement from God. I think they were most likely murdered pure and simple – if not by Peter, then some of the others hearby. That doesn’t invalidate my faith – it merely shows that the early Christians were imperfect people, in need of as much grace as any of us. Every person will obviously have to do their own soul-searching about this story. It would obviously been wrong in God’s eyes to murder them, but is that any different than many contemporary examples we see of greed, lust and sin among Christians (and even some well-known Christian leaders) today? And our hearing of those sinful acts in our contemporary media doesn’t invaludate our faith today. Here is another possible way to look at it. Acts 4:33 “Great grace was upon them”. Acts 5:33 “why has Satan filled your heart to lie?”. 1. Grace was actively and fully moving. 2. “But” serves to compare and contrast Barnabas with Ananias and Sapphira. 3. Ananias and Sapphira reject this grace and give themselves over to Satan. 4. Nowhere does it say God or Peter killed this couple it can only be assumed. 5. This couple gave themselves to Satan and rejected the grace of God, they chose to be tares when they could have been wheat. 1. Jesus did not come to condemn. 3. Those who do not believe are condemned in their unbelief. I believe what we see here is a complete removal of God’s grace from Ananias and Sapphira by their willingness to give themselves over to Satan. Satan is the deceiver, liar and muderer. They chose Satan over God.